The best day to be at work is after an Arsenal win the previous day/night – unless you don’t support Arsenal. Most of my Chelsea friends have been absconding from work for the last 4 months, appearing just once per month. Tuesday morning at work was great. I walked around with a chip on my shoulder, peacocking around, looking for troubles on the desk of my colleagues who supports the other teams. Although I tread with caution when I get to my boss’ desk. He is Blue and he has been on the edge recently following the unique way Chelsea have been going south. If he has his way, he could have stayed at home sulking. My other colleagues are constantly being intimidated by Arsenal’s form and results. I usually add pepper to their injury with my showcase of Arsenal wares. It surely is not so glorious when Arsenal fail to win but the respect is brewing to be capped up with a league title by the end of the season. Unless, the Foxes continue in their jet form, I don’t see why Arsenal shouldn’t win the 2015/2016 Premier League title. Chelsea are lost, United are staggering, Liverpool unstable and City are 4 points behind. Arsenal are without 2015 revelation Francis Coquelin. Santi Cazorla and Alexis Sanchez are also out but the Gunners have taken three points like nothing happened. I wonder how the team will play when the aforementioned trio and the rest including Rosicky, Wilshere and Welbeck returns. Campbell has stepped up and is filling the void well enough. Flamini has made us forget Le Coq. He is doing well in the middle with Ramsey. Walcott and Giroud are banging in goals. Petr Cech is saving goals with his fantastic four defenders putting up superb shifts. 2015 has been wonderful but it must translate to trophies by the end of the season. The stats are juicy but the trophies count. Arsene Wenger is as classy as ever. 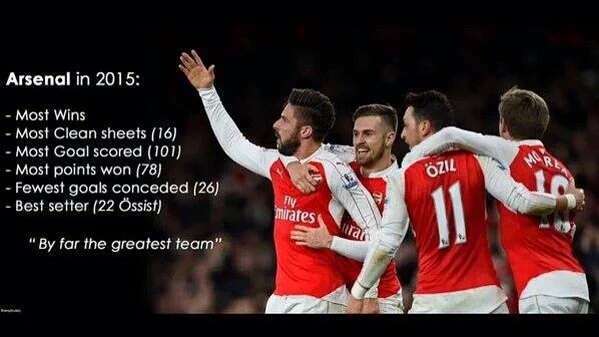 The Arsenal team keep showing the world what a team should look like. The holiday starts with Southampton. One game at a time and the Gunners will reach the promised land. It is a long one for me but a tedious one for the players. We can win all the games in the festive season. Don’t forget the FA cup is around the corner too. Another series of drama is about to unfold in the glass house of the Nigerian football federation. Watch out. The 2016 Nigeria league is expected to start by January 31st. Before then, enjoy the season.